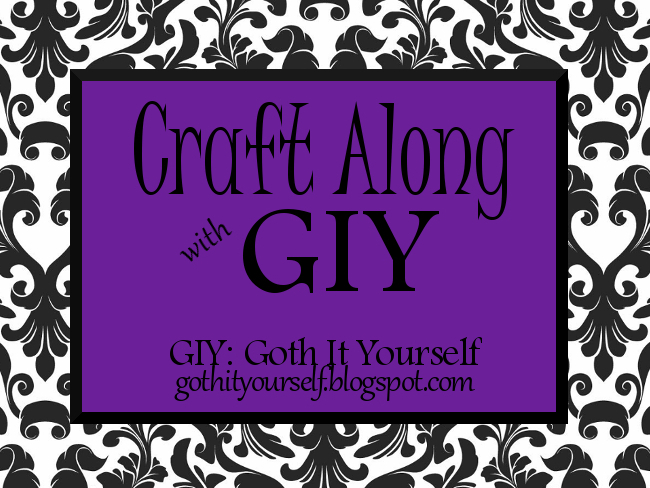 The theme for the first Craft Along with GIY is Pets. For my project, I turned a pair of secondhand end tables into dog beds. Both my small dogs love a cozy spot to snuggle into. The Chihuahua mix loves cozy little nooks so much, I named her Nook. :) When I saw how much she adores the enclosed bed I made from a repurposed kitchen cabinet (now known as Nook's nook), I wanted to make something similar to put in the living room. I also needed end tables in that room, so the clear solution was to find a couple of the cabinet-style end tables and make them dual purpose. It's far less clear what to call the end result. It's not just a bed; it's enclosed. By shape, it's more like a dog crate or dog house, but a crate usually has a door that closes and a house is generally outside. From Nook's point of view, the whatever-it's-called has two important characteristics: it's soft and it's enclosed. Maybe I should call it a cozy box. Anyway... Moving on to the project details! I found the perfect cabinet-style end tables at a thrift store. I began with a coat of primer. I used Zinsser latex primer which I'd had tinted grey. Straight from the can, this primer is quite thick and dries SUPER fast. I added a heavy dose of Floetrol, which makes the primer dry more slowly, providing more work time, and greatly reduces brush marks. Next, a coat of paint. I used Behr latex paint in "Black" with Floetrol mixed in. At this point, I could have just taken off the doors and considered the project complete. But I wanted the tables to have an opening on a long side, so I'd need to cut doorways. I thought picture frames would provide ready-made decorative trim. I found a pair of frames for $4 at a thrift store. Using my chop saw, I cut the bottom off each frame. I placed the three-sided frame on the side of the table and traced lines along the inside of the frame. These lines would guide me as I cut out the doorway. These are the tools I used to make the doorways: a jigsaw, a drill with a spade bit, and an oscillating tool with a saw blade. Before cutting, I placed masking tape along the lines. The tape helps prevent splintering or damage from the jigsaw. Using the spade bit, I drilled a hole at each inside corner of the soon-to-be doorway. Then I put the jigsaw blade down into the holes and sawed along the masking tape to cut out the doorway. I used the saw blade on the oscillating tool to finish each cut at the bottom and clean up around the corners. With the doorway cut, the ugly brown inside of the table could now be seen. Rather than struggle with painting or papering inside the confines of the table, I decided to make a panel that I could simply slide into place. I measured the inside back wall of the table and then marked out those measurements onto a piece of foamboard. I cut the foamboard to size. I covered one side of the foamboard with adhesive shelf paper, folding the paper around to the back. Then I simply opened the table door and slid in the panel. It was a snug fit and stayed in place by itself. Next, I attached the frame around the doorway using construction adhesive. Then I gave everything a final coat of black paint. To make a cushion, I cut a piece of foam to fit inside the table. Then I made a cover by cutting and stitching a standard pillowcase down to size. 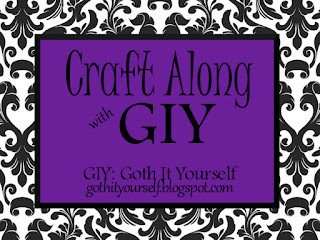 To share your Craft Along with GIY project, leave a comment with a link to your project. Wow, that final picture! They really liked it and understood the purpose! And I'm always amazed by what people find at thrift stores, I wish we had such a thing too. We have stores for used clothes (and the occasional bag or belt) and flea markets for random garbage. There is absolutely no place where one would legally get old furniture and frames in the whole country. Maybe I'd be more motivated to craft along if I didn't have to buy all new supplies and make things from scratch. :( Wow. That really stinks! Yes, having to buy everything new could certainly put a damper on one's enthusiasm. I don't think GIY would exist without thrift stores. Your bookmarks are fantastic! :D Thanks for participating. These are such gorgeous dog beds! Lucky dogs! Lucky dogs :-D looks great!